The deployable cover is a form of Covenant equipment. This piece of equipment is similar to the stationary shield generator, except mobile. Any solid projectiles fired will be deflected by the shield; however plasma-based weapons fire are absorbed by the shield from either side. However, the Spartan Laser is capable of penetrating more than five deployable covers. The user is given an enormous tactical advantage in exchange for being exposed from behind and to the left and right, so it is wise to deploy it towards your main threat, whereas the similar bubble shield provides 360 degrees of cover, but cannot be fired out of. The shield is deployed in the same manner as all other equipment in the game, and it will stay activated until it takes enough damage, or if left untouched for too long. The shield's health is represented by its color: it is normally blue, turns red/orange as it is damaged, and finally deactivates. If left alone, the shield will regenerate to full health. To deactivate the shield permanently, the base must be destroyed. This only works in campaign. In multiplayer, the deployable cover will self destruct after 30 seconds. Like the portable gravity lift, the deployable cover, when activated, will be destroyed after a fall from a great height. There is a flaw in the deployable cover's shielding design; a small gap in between the shields exists where players can fire through. This "hole" appears to work from any angle and allows most human weaponry to pass through. However, the shotgun is not affected, probably due to its wide spread. The deployable cover is often used as an area to jump from, as it is easier to use than the grenade jump for some players. One can use this tactic to get both of the skulls, Famine and Cowbell, from the level The Ark. 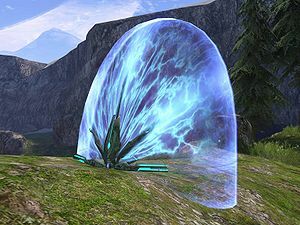 In campaign mode, the deployable cover is completely immune to the solid projectiles fired by Flood Ranged Forms, making it very useful on the eighth level of Halo 3, Cortana, especially on higher difficulties. Enemy AI cannot detect the player through a deployable cover, even on Legendary, making it possible for a player to take cover right in front of the enemy. This can be especially helpful on part of Crow's Nest, where eight Brutes plus a Chieftain are present, as there are multiple deployable covers available. It is possible to gather enough deployable covers and create a makeshift but stronger imitation of a bubble shield. It will not be covered on top, which may allow people to jump over. This tactic is not practical in the battlefield. The deployable cover is available only in the multiplayer playlist "Action Sack". The custom Foundry map "Front Line" has four available deployable covers on it. The deployable cover is vulnerable to the power drain. In Halo 3, if a deployable cover is placed in a Pelican cockpit, the Pelican will spin around, eject the pilots and fall through the map. Demonstration of firing from behind a deployable cover. The base of a Deployable Cover after the shields have been depleted. The Deployable Cover HUD icon.